Speaking in the Warriors Corner venue at the 2018 AUSA Annual Meeting and Exposition in Washington D.C., Brig. 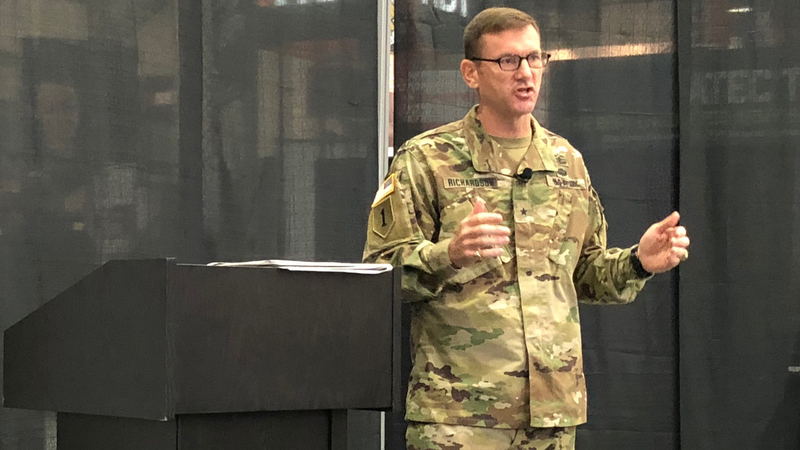 Gen. John B. Richardson, director of Operations, Readiness and Mobilization, G-3/5/7, outlined the evolution and current vision for Army Reserve mobilization planning. Richardson began by offering a historical perspective of reserve mobilization thinking in the years between Vietnam and Operation Desert Storm, noting the mandates of the current National Military Strategy/National Defense Strategy called for a new way to view mobilization. He said the mobilization efforts and training for the warfighter during the period 2004 to 2013 had been largely COIN focused, but that philosophies began shifting toward Decisive Action training for the Total Force in 2014 to 2017. Along with that change was recognition that future actions against near-peer adversaries could require much larger mobilization. In addition to manning, training and equipping, the potential mandates of larger mobilization would have significant impact on force projection installations. In fiscal 2008, the Army had 10 Mobilization Force Generation Installations (MFGI), but that number had dropped to just two by fiscal 2018. Under the new mobilization thinking, FORSCOM involvement will include up to 11 primary and 14 contingency installations. The 2019 Army budget was enacted before the start of the fiscal year. Will This happen again for 2020?